The Grinder 12-string bass was built by Alex Berezin from Moscow, Russia. Alex has built a number of 12-string basses over the past decade. While this bass served Alex well on stage for a few years, it has now been retired due to neck issues. The only one still alive is a 15-string bass, but it has a much wider neck, which probably helps. 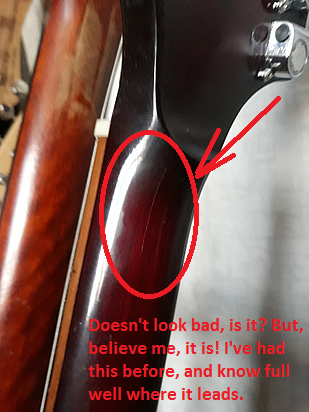 To add a short disclaimer though, while my personal experience with 3-piece necks with Bubinga in the center is pretty much all bad, it's still obviously possible that other people might have better luck. This is just a friendly warning to the others who might want to try it out.